Today I want to talk about successful negotiation and how you can hone that skill. One of the most important skills that all real estate investors must develop is good negotiation skills. When the subject of negotiation comes up some folks will tell you that this comes easily for them. For others, it is much more difficult. Whether it is easy or not, this is a skill that everyone can learn with practice. Successful negotiation skills did not come easily for me. I know I sure could have used some tips for successful negotiations when I was brand spanking new. Many years ago when I bought my first property, I had a realtor friend from my investor’s group negotiate the deal for me. When the investor (seller) wanted to talk to me personally because he didn’t like the way the negotiations were going with the Realtor, I was so scared I refused to talk to him. (I knew it wouldn’t end well for me.) After a little “back and forth” on the price, my realtor friend /negotiator refused to back down, and I got my first deal at the price I wanted to pay. I don’t have any problem negotiating deals today, but it was a learning process that a lot of new investors will need to work through. An investor friend told me something a long time ago that I have always remembered. We were talking about negotiation and he said, “If you are not embarrassed or at least uncomfortable by your (low) offer, then you have just offered too much for the property! So What Exactly is Negotiation? 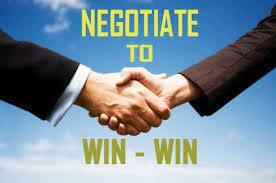 Negotiation simply put, is when two or more people try to reach an agreement about something. For real estate investors, this will almost always involve buyers and sellers. It has been my experience that when everyone leaves the table feeling good; like they have “won”, you have just completed a successful negotiation. On the other hand, when you just can’t make a deal come together, realize that maybe you just aren’t right for each other. When you are dealing with someone that has a large list of objections, can’t make a decision, or you just can’t seem to reach an agreement with, this is probably a red flag. This is the same person that will either have buyers’ remorse after signing the contract or you will hear from a hundred times after the closing. This brings me to my next point. Know when to walk away! There are some simple guidelines that you can follow to make successful negotiations easier. Do your homework. Whether you are buying or selling a property, know what the comps are, how much the repairs will cost and what a realistic ARV is for the property. Having all of this information will be invaluable as you try to negotiate the deal. What is your desired outcome? What is your absolute bottom line? Knowing what you must have from the negotiations is essential. Be prepared to really listen to the other person. In addition to the price they say they must have for the property, is there something else that they really need? Closing Costs? Moving Expenses? Maybe they just can’t face cleaning out “mom’s” house. Many times the seller will take less for the property if you can solve some of these other problems. Don’t try to beat up on the other person. Understand that they also need to win. Getting top dollar may not be what they need to feel like they “won”. Realize that there will be times that you will just need to walk away. In fact, sometimes that is the only solution. Remember the line in the old Kenny Rogers song? “You have to know when to hold’em. Know when to fold’em.” I’d say that is pretty good advice. ← What Kind of Real Estate Do I Want To Invest In? Hi sharon……I agree with you. you share all the facts of negotiation. It helpful to win. Sharon…all good points on negotiation. And yes Kenny’s song is so true. Any good negotiation has to be a win-win or it won’t work. You need to know your pros and cons going in so you are in the right position to handle the negotiation for a good outcome. I agree completely. You have to go into the negotiation with all the facts. And it always has to be a win-win. Thanks for your comments. I love this article Sharon. I have had a challenging time learning this skill. Most would laff at my tactics. Though it might take me more time it seems people feel like I am someone they can trust so it’s working for me . . . for now. I especially like when you said to realllly listen to them. That’s the biggest part for me. It is super important to me that they feel like they won too.